This article is basically the summary of all the watercolour set I've reviewed over the years. It's a quick guide for beginners who want to get their first watercolour set. 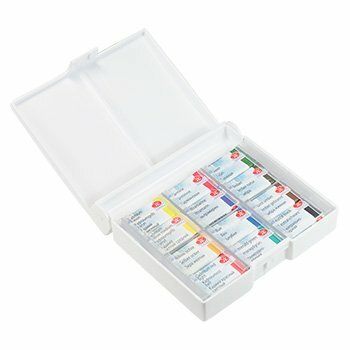 Student quality watercolour box sets usually cost under USD $20 with 12 colours included. If your budget allows, get artist quality paints instead of student grade ones. Artist quality pigments would be more saturated and has stronger tinting strength. Just a small amount pigment will give you the intensity that you need. You use less of the pigment, and your paint can last longer. If you're low on budget, get less tubes of artist quality paints instead of more tubes of student grade. For example, 2 sets of primary colours (6 tubes total) can give you immense colour mixing potential. I recommend starting with a box set of 12 pan colours. Many brands offer a good selection of colours to get you started. Pans are also more convenient to use and easy to bring along anyway. Even though I have tube paints, I would squeeze them into pans for transport. Watch this video to find out why I do that. The more popular student grade quality watercolours are Cotmon from Winsor and Newton, Van Gogh, Akademie from Schmincke, St Petersburg White Nights and Prima Marketing. They are all quite affordable. The two brands I would recommend for budget conscious beginners will be Winsor & Newton's Cotman Sketcher Pocket Box and Prima Marketing's Tropicals Set. Cotman (review) is quite good in terms of colour intensity. If you have a few more dollars, I suggest you get the Prima Marketing's Tropical Set. This USD $20 set really surprised me with its intensity. 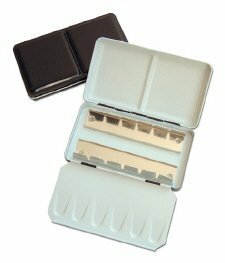 At this price, you usually can only buy an empty metal watercolour box but this set comes with colours. The downside is there's absolutely no information regarding the pigments used. For the price and performance, it's well worth the money. The other very affordable set is the St Petersburg White Nights watercolour that I mentioned earlier. The box is almost two times larger than the WN Sketchers Pocket Box, but it also holds two times more volume of paints as the pans are also full size. It's still a relatively compact and lightweight set. The downside is the paints appear slightly chalky to me. So those are the three sets I recommend for budget conscious beginners. 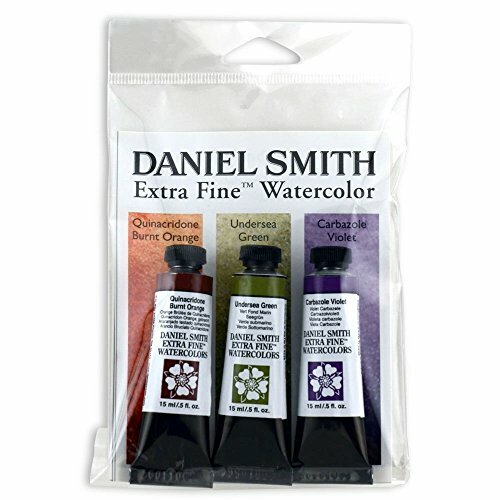 I should also mention the Daniel Smith 6-tube Essentials set. This cost USD $30 and there are six 5ml tubes. The colour selection is great. With 2 sets of three primary colours, you'll be able to mix a good variety of colours. Even thought it has less colours compared to the other sets, I feel that you'll learn more about colour mixing. The other sets with more colours just have more convenient colours that helps you save time when mixing, e.g. when mixing greens for example. The downside is for the price, you don't get a box. If you get any of the box sets above, you can this this set as a refill and also to try out Daniel Smith. On Amazon, you can find these two sets as well, one with Perylene Red, Hansa Yellow Medium and French Ultramarine and the other with Quinacridone Burnt Orange, Undersea Green and Carbazole Violet. Each set sells for around USD $22. That's almost like buy-2-get-1 free because each 15ml tube usually cost around $11-15. 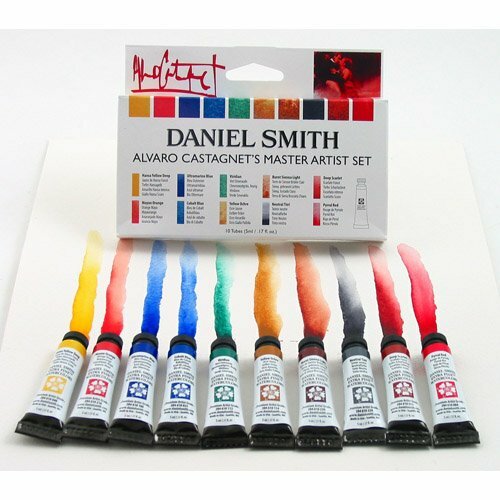 If you have more budget, perhaps check out this Daniel Smith set with Alvaro Castagnet colours (currently at USD $52). Another good set to get is the Mission Gold 9 tube introductory set. Each tube has 7ml so it can refill a half pan 3 times. The downside is there's only one blue in the set. You might want to add a French Ultramarine. If you get yourself an empty palette box (around USD $25) and empty pans, you'll have the flexibility of choosing your own paints. With your empty watercolour box, I suggest getting the M Graham Basic 5-color set (USD $35) or the Intermediate 10-color set (USD $75). Each tube is 15ml so you'll be able to refill your box many times over. Quite a good deal. 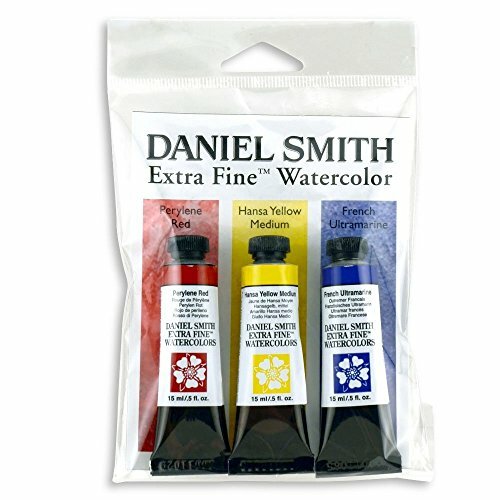 Daniel Smith is a good brand also and I would suggest Hansa Yellow Medium, Transparent Pyrrol Orange, French Ultramarine, Phthalo Blue (Green Shade) and Burnt Sienna. Each tube is around $14 so the five tubes cost $70. OR get the two sets of 3 tubes that I mentioned earlier. Generally speaking, you just need six tubes of colours that consist three pairs of primary colours to be able to mix most colours that you'll need. If you need help picking colours, check out the article where I invite artists to pick their 12 colours. So you're the beginner with more money to spend? I watched your review for white nights on your YouTube channel but there you said it isn't chalky but here I read that it is chalky... I am so confused... I find prima colors to be chalky but should I buy white nights?? White Nights is better quality in my opinion. There are a few opaque colours in the White Night sets, so if you might with them then it's going to be chalky. Hi!!! I have bought the Prima watercolour (tropical) based on your review for travel and sketching and boy I enjoy that set so much! I add the Payne's grey because I love it very much. 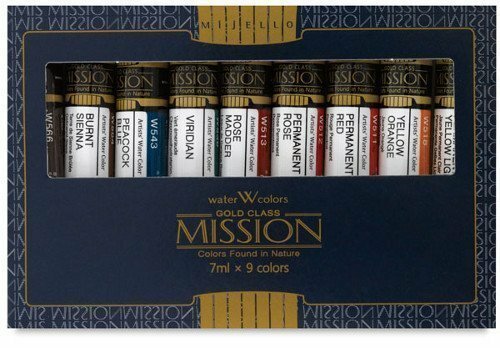 I have Winsor and Newton professional watercolours, I love too, although I find their earth colours and viridian a bit weak in my opinion. So thank you very much !